I'm knitting a Boyfriend Scarf out of Quince Puffin. It's my first time knitting with Quince. I'm allergic to wool, so this is kind of a leap (into Benadryl;-). I really wanted to make a special scarf and this seemed the perfect yarn choice. It's wonderful to knit. Now I understand all the fuss about wool. I can only work on it for short periods, so it's taking quite some time, but when it's finished, I plan to try to knit two more before Christmas! Ahem. Highly doubtful that will happen. I'm reading A Grief Observed by C. S. Lewis. Mine doesn't look like the one pictured on the Amazon page, but that is the link I used to order. Actually, I'm listening to while I knit. I made it through the first 45 minutes or so, and had to step away for awhile. Definitely very intense reading. But Lewis is a master of making sense of the inexplicable. This book takes some time to seep in and then, it does begin to untangle some knots. I bought three copies of the book. Mary Beth is reading. I have one for Megan. Michael was waiting here the other day before I came home. The third copy was on the counter. I dashed in because I wanted to inscribe it for him. He'd already noticed it and was well into it before I'd arrived. Michael has long been a student of C. S. Lewis. It kind of breaks my heart that this book is so appropriate for him right now. And yet, it most certainly is. He's walking in the shadow of the valley of death. He's right there beside his friend, wrestling fears and doubt with him. He will emerge into the light just fine. 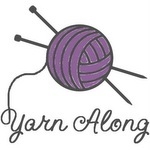 Visit Ginny to see what's up in the knitting and reading world this week. I finished knitting Katie's sweater just before Karoline's First Communion. So, she got to wear it with her Easter dress on First Communion Day. She was thrilled. Me? Not so much. It's full of mistakes. I wish I knew what they were. I mean, I know they're mistakes, but I don't know why. A girl can't learn from her mistakes unless she knows why. My plan is to photograph all the mistakes and email them to a friend. I was thinking yesterday about how I learned to knit. True, Elizabeth came one weekend and overwhelmed me with knitting love. I didn't really get to learn much that weekend, though. Then, Ginny unraveled my knots in real life. That was good. But I still didn't know how to knit. It was important to Elizabeth that I learn, so it became important to me. Carmen became dedicated to the cause, too, and suggested a pattern and sent me the link. Elizabeth dyed and spun the yarn and then tutored me through 5 or 6 of those sweaters via email. Katherine has encouraged every step of the way, via email or Instagram. Ladies, I learned to knit on the internet! This makes me giggle. I'm going to email my mistakes to Carmen and try to learn a little more. The internet has exploded in the last ten years--there's so much we can learn here. I dug out a very familiar book the other day. And I started re-reading. I think I wanted my younger self to give my now self a good kick in the pants. It worked. I'm sprucing my education plans here. Someone (actually, more than one someone) wrote to me and mentioned how much she'd like to see me update and republish Real Learning. I've been reluctant. For whatever reason (or for a myriad of reasons), I've never been inclined to re-publish. One day recently though, Aimee offered an idea that does appeal to me. Actually, Mary Beth, Christian, and Aimee each offered the idea separately, but it didn't really seem feasible until I talked it all through with Aimee. What if the new version of the book weren't a book at all? What if it were a workshop? Eight or ten installments with various chapters from the book, all updated with links and photos and video. What if the "Words from the Wise" section checked in with veteran homeschoolers and what if we created community? What if we set aside a small space online to encourage one another to educate our children wholeheartedly (whether homeschoolers or not)? What if we engaged in conversation and those of us who have been at this a long time recommitted to our ideals, while sharing hard-earned wisdom with younger moms whose enthusiasm is contagious? Yes! I'd like to see the book become a big idea like that one. Sometime in early January (or maybe it was December), Ginny called with an idea: she was going to go to a conference in South Carolina with her mom, and Ann Voskamp was speaking there. Remembering the time we spent two years ago, Ginny wondered if I'd fly to Charlotte with her before the conference. Ann could meet us there. The plan was to spend some time visiting Elizabeth DeHority. Then, she and Ann would drive on to the conference. In the comfort of my kitchen, with late March far enough away, I readily agreed and planned to stay an extra night so I could extend my time with Elizabeth a wee bit. My sweet husband looked dubious. I'm not the most intrepid traveler. But he agreed and found a flight and presented me with tickets. I was going. The time came and I found myself in the car on the way to the airport. My cell phone rang. It was Sarah. Crying. Putting her to bed the previous night, I'd promised to read her Cinderella over breakfast. She was asleep when I kissed her goodbye. And she was devastated when I wasn't there. I promised to read as soon as I got to the gate. First, I had to stop crying. I don't leave easily. I kissed Mike goodbye, did all my shoe removal and whatever and made it through security. I found my way to gate, googled Cinderella, found a story online, and called Sarah. I had to hold the phone away from my face to read the story. And I had to hold it way, way away from my face to see the tiny font. So, I sat in Dulles Airport, my phone on speaker, and shouted Cinderella to my daughter while she ate breakfast. When people glanced my way, I just met their gazes with a look that said, "What? You don't do fairytales for breakfast?" Shortly, Ginny joined me. And we did what we do when we're stressed. We whipped out our knitting. There we sat, sitting and knitting--the weird lady who shouted Cinderella and her friend. We knit and chatted all the way to Charlotte, navigated the airport quite handily, and found ourselves hugging Elizabeth before too long. We spent several happy hours back at the hotel, chatting, knitting, drinking tea, and eating exceedingly good takeout food. Then, we headed back to the airport to gather Ann. It was late when we returned to the hotel and Elizabeth went home to bed. Ann, Ginny, and I kept talking until the wee hours of the morning. Ginny and I even got to share Nicky's wedding toast with Ann. The next day, Ann and Ginny left after lunch time. I drove Elizabeth to a fabulously giant fabric store and spent way too much time thinking about buttons. We had plenty of time to just talk. And listen. It was a much, much earlier night. Elizabeth went home to her boys and I spent my first night alone in over 25 years. The next morning, I got a little bit of a violin education when I had the great pleasure of accompanying the DeHority family to a group violin class and an adjudication. We spent a pleasant morning and early afternoon at the Community School of the Arts and I got to meet several of the people who live and learn with my friends. All too soon, I was on my way back to the airport to head home. Home! I arrived at the Charlotte airport two hours before departure, got through security, and walked all the way to the E gate. Then I received a phone call that my flight was at least 40 minutes delayed. I called Mike and he nudged me towards customer service. There, I inquired about earlier flights and switched my destination to Reagan, instead of Dulles. The very kind woman at the gate said there was a flight boarding at the C gate and encouraged me to make a run for it. Run I did. And I boarded. I landed at Reagan 10 minutes after my original departure time. Mike just happened to be nearby in McLean for Nick's game (which was delayed half an hour). He came to get me and we arrived for kickoff:-). On Sunday we loaded up lots of people and went to watch Paddy's first collegiate game at RFK. He played really well and we hardly noticed the cold (not). We left DC and headed back to McLean to watch the team Michael coaches win a tournament and then to watch Nick save a penalty kick and the game to win his tournament. I held my sweet Sarah all day long and returned home to sink exhausted into my own bed. So far, the above reads like a boring play-by-play of someone else's travels. There were lots and lots of thoughts "thunk" during those days and lots and lots of prayers prayed. Some of them remain to be pondered in my heart. Some are the overflowing gratitude that begs to be shouted from the rooftops. I'm so grateful for the women who traveled with me. In so very many ways, they've traveled life, with me, too, these past couple years. It's hard to believe it's only been two years. Ever feel like you've known someone a lifetime? And I'm ever so grateful for the dear friend we visited. Her hospitality, her awesome socks, and most of all her willingness to let us just *be* with her were great gifts to us all. I'm grateful to two women from whom I begged special prayers. They know who they are and apparently, God does, too. Wise women. Great pray-ers. Prayers answered. Thank you. I'm grateful for a dozen hours alone in a hotel room, where I stretched my body and my soul and renewed my spirit in ways that evade words. Mostly though, I'm grateful for homecoming. I'm grateful for the big bear of a man who happily gathered me into his arms at the airport, the guy who kept looking at me the rest of the day. I'm grateful for "the big girls"--Mary Beth and Kristin-- who filled the days with grand adventures for the little ones. I'm grateful for my quiet young man, who sent his heart with me, and then sent Elizabeth and me a group text with good news so he could be part of our time, too. And I'm grateful for the soccer bunch, because really, nothing could have felt more like home than freezing through three soccer games with Sarah on my lap, both grandpas in the stands, and soccer siblings doing their things. Home is a grand and glorious place. And this life? It's time to begin to dissemble the Christmas decorations. First up this morning was the dining room tablescape. I really need to use the whole table today to try to make some progress on sewing nightgowns while flannel is still a desired fiber. So, the promise of sewing was just the shove I needed to get going on the packing task! As I store things carefully, I ponder the fact that I must get back the strict autoimmune protocol Paleo way of eating. I'm consoling myself by remembering that if I hadn't veered off the straight and narrow, I wouldn't have such proof-positive that I cannot veer off the straight and narrow. Food. Sigh. Such a weighty issue. To that end, it's a good thing I'm slated to share Cravings here with you next Monday as part of the release celebration blog-hop: pray, love, and then eat. It's really a wonderful read, so perfect for me right now. And knitting? I'm knitting a Tiny Tea Leaves cardigan for Katie for Easter out of Amy Butler Organic Aran in Poppy. I very much love to knit ruching. Very much. ~ Two of my favorite things are knitting and reading, and the evidence of this often shows up in my photographs. I love seeing what other people are knitting and reading as well. Join me at Ginny's to see what the whole bunch of us are reading and knitting. Perhaps you know the story? How St. Martin of Tours, upon encountering a poor beggar suffering from the cold, ripped his own cloak in two and covered him? "Martin, what you have done for the least of your brothers, you have done unto me." That's what Christ said to him, the following night in a dream. And that's the spirit in which we celebrate the feast of St. Martin - Martinmas. Giving of our abundance, going through our clothing and boxing up the gently used for the less fortunate. Knitting needles clicking fast and yarn moving through my fingers, knitting up warmth to offer as gifts to my little ones. I've been looking forward to this day, November 11. And it was a just a few weeks ago that I began planning -- wondering what could warm the hearts and bodies of my children on Martinmas. As perfect timing would have it, it was just a few weeks ago that I found Nicole's pumpkin hats. Needless to say, in no time I was browsing cubbies full of yarn at our local yarn shop, searching for just the perfect shade of orange. I did find that perfect shade, I do believe. This week I'm working on a fourth pumpkin hat. (Here's my Ravelry link.) As far as saving these hats for Sunday, the little ones will have none of that. Little heads and ears are already being kept warm. I'd have it no other way. Those last two photos bring me back to Martinmas and my current reading. This week I've pulled an old favorite off the shelf, Mrs. Sharp's Traditions by Sarah Ban Breathnach, a Victorian-inspired almanac of family celebrations. If you have the book on your shelf, you can pull it off too and find the description and directions for creating Victorian paper lanterns for Martinmas. We began with watercoloring the lantern paper (just plain old watercolor paper.) Saturate the paper with color and coat the dried paintings with vegetable oil, that's all the children need to do to make a beautiful lantern. We're still working on our lanterns (the Foss children too) and Elizabeth and I hope to share the images of softly colored Martnmas light from our homes very soon. But in the meantime, I've put together a few links for you, just in case you'd like to capture light this season with your children as well. Here's an easy watercolor paper lantern tutorial. Or how about this tutorial on folding a traditional star lantern out of those watercolor paintings? (There's a video tutorial too.) And for those of you like me who love, love, LOVE plant-dyed wool felt, here's a tutorial for creating a felt lantern bunting. Join Ginny for more Yarn Along posts. Hello again! This is Edith and I'm so excited to be here with you, joining my friend Ginny for this week's Yarn Along. I thoroughly enjoyed our time together for needle and thREAD and am just plain giddy about turning our conversation to knitting. I do so love knitting! A legend, that one. Don't you just love her? I do. Not only because she is, like me, a quirky continental knitter. (You've read the story of her governess "correcting" the English-style knitting she learned from her mother? Apparently continental knitting had been all but abandoned in England during World War II due to its association with Germany. Ah, the politics of knitting!) No, it's not simply common technique behind my fondness. There's a true genius about Elizabeth Zimmerman and what I adore most is her brilliant humor. Really, you must pick up a copy of one of her books. Knitter's Almanac? Knitting Without Tears? Or how about a volume of her columns, The Opinionated Knitter? Whether or not you venture to recreate the patterns she "unvented," you'll love her wit. Pick up a multiple of 4 stitches around the neck and work in knit-two, purl-two ribbing until you are sick of it. She's charming. And truly, she revolutionized knitting. Before the days of Ravelry's dizzying database of detailed patterns, knitters simply knew how to use a system of proportions to create garments. Elizabeth Zimmerman was the first to break down that mysterious knowledge. She unlocked the secret for people like me, those of us who are rather fond of following recipes. So I'm slowly branching out these days, trying to learn the logic of knitting. But not wanting to venture too far, too soon into uncharted percentage systems, I casted on a project based on Elizabeth Zimmerman's legendary February Baby Sweater, just to get a feel for her designs. Most likely you've heard of it, the February Lady Sweater? It's an adult-sized version of the baby cardigan adapted by Pamela Wynne, conveniently written in the style of a modern pattern. I chose a hand-dyed merino wool by the Chilean artisans of Araucania. This aran weight yarn is one of their Toconao Multy variations. It captures autumn, my favorite season. I've only just finished the yoke and separated for the sleeves, but I can already tell you how much I love Elizabeth Zimmerman's gull lace pattern. Easy to memorize, easy to correct when your scooting infant pulls up on your chair and rips your work right out of your hands and hundreds of stitches fall off the ends of your needles. No use crying over dropped stitches with this pattern. But I didn't have to work through the lace section to fall in love. My 14 year old daugther, Marianne, has her own February Lady Sweater in the works and is a bit further along than me. She's knitting hers in Spud and Chloe Sweater Yarn. She says it's a dream to work with. Upon writing that last sentence, I promptly left my keyboard to inspect my eldest daughter's tote. And yes, it too matches her project. Eleanor is knitting Hannah Fettig's Contended Cardi in Blue Sky Alpaca Worsted Hand Dyes. She asked for the yarn for her 17th birthday. That cardigan calls for about a hundred thousand yards of alpaca. I told her that her father and I could A) send her to college or B) buy her that yarn. She chose the yarn, smart girl. Of course, I'm only joking. We'll still send her to college. She just better wear that sweater every single day of it! Enough about yarn, let's talk reading. My matchy-matchy girls and I are devouring the Bronte sisters and have been thoroughly entertained...in a dark, depressive sort of way. Today we're listening to the last 30 minutes of Wuthering Heights on Audible. Of course, we could just read aloud together, as we have done for years, but we've recently transitioned to audiobooks and called it a daily knit-a-long. Knitting and British ghost stories. It doesn't get much better than that, now does it? Mr. Feinnes is wonderful, as usual, but oddly cast, I must say. Ralph Fiennes as a strapping, dark-toned gypsy? He's too refined, too slight of build, the girls and I said. However, we were pleasantly surprised to find the part of Nelly Dean played by Janet McTeer, the talented woman who read the parts narrated by Nelly on the audio version we've been enjoying. She's absolutely wonderful. Really, you should download the story and listen. I promise, it'll go great with your knitting. Knit on with confidence and hope, through all crises. Join Ginny for more knitting and reading. What Ginny really wanted, less than a week ago, was someone to test knit the smallest size. And I knew just the person. I made an introduction between two of my favorite, most creative people and in return I had all the fun of watching Ginny's pattern come alive in my dear friend's hands. Since there aren't too many completed Sunday Sweaters in the world just yet, my friend--who doesn't blog--has graciously agreed to let me show you her Sunday Sweater. ~Yarn: Wooly Wonka Aerten DK, a merino, cashmere, and nylon blend. The color is Dark Roast. ~ The pattern leaves no guess work. Each step is fully explained; even when telling you to look at right or left side of the garment, Ginny tells you whether you're looking at "my left or your left." ~The stitch count is given throughout. You won't knit rows and rows and then suddenly realize you're off count. She calculates the count after every increase row. -~There is very little finishing work since it's knitted top down and seamless. ~ It's so easy to size! Ginny gives industry standards for arm length and tells you how to get just the right fit. - My friend will be knitting another. ...and I can't wait to start my first! Join Ginny for more knitting and reading yarns here. Extra Yarn is actually a new one, despite my promise to myself not to buy new. I couldn't resist! It's the story of Annabel, who finds a box of yarn that just keeps giving. She knits for the entire town and then starts knitting covers for houses and trucks and trees. Her box of yarn keeps giving and she keeps knitting! Her previously dingy gray town brightens beautifully at the work of her hands. When an archduke offers her huge sums of money for box of yarn, things get interesting. My girls can't get enough of this book! Dye your own rainbow yarn. Write a different ending. What if Annabel had sold the yarn? Here is the yellow sweater. I started it way back in July, I think. I've made slow progress ,which got slower daily. My left hand kept cramping. I'd shake it out. Then, my whole forearm started hurting. Finally, I had excruciating pain in my elbow. When I knit. When I keyboarded. When I lifted a glass of water. When I lifted a child. When I pushed a stroller or a grocery cart. When I swept the floor. When I folded laundry. Finally, I pretty much couldn't even get my arm to do those things. And now, I can't knit. or any of those other things. I can type with one hand. It's not very efficient. The yellow sweater will wait, probably until the spring. And I will feel so badly, because Katie loves this sweater. It barely fits her now. It's not going to fit in the spring. Karoline has to feel pretty lucky to be the kid who gets the too-big sweaters and the too-small sweaters. Ever since I learned to knit, my morning routine has been much the same. I knit and listen to the Bible on audio. It is a beautiful way to start the day. In all honesty, I hate the fact that this injury has rocked my morning rhythm. I'm a better mom with my Bible and my knitting. Starts my day in a very good way. We're getting after some pretty aggressive therapy, so hopefully, I'll be able to knit when we drive to Florida in January. In the meantime, handmade Christmas gifts will be of the sewn or baked variety. And my morning routine will embrace Lisa Hendey's new book, a candle, a notebook and the commitment to do some journaling in my own handwriting, with my right hand and a pretty pen. I do love this book. I've reviewed it in depth in my latest column. And I recently talked with Lisa about the book on a Faith and Family podcast. Thus ends my last Yarn Along for awhile. I'll miss you all! Go visit Ginny for more knitting and reading. I started a post yesterday morning. I wrote rapidly and with passion, all about text messages and mean girls and life and death and the drama we create versus the reality God intends for us to live. After days of sitting with Rachael, waiting while her father was dying, Mary Beth was at home at our dining room table, trying to wrap her brain around a math lesson. Her cell phone, her iPod, and her computer were fully awake beside her. Normally, we don't allow electronics during school hours, except for academic uses. But Rachael had been texting pretty much all of the previous 24 hours and I was keeping a careful watch as girls rallied around her, some of them in person, some from miles away via social media. Suddenly, there was silence. In the silence of those morning hours, we all knew that Rachael's dad was drawing his last breath. I tried to upload my post to Typepad. Typepad would have none of it. It disappeared into cyberspace. I quickly figured that was probably for the best and moved on to the next thing. I gathered my little girls on the couch and read Little Red Riding Hood. Just as the woodsman released the grandmother and little girl from their canine tomb, Mary Beth came toward me, laptop in hand. Rachael's brother had updated his Facebook status with a tribute to his father. There was his birthdate and his death date. In a few moments, Mary Beth was at Rachael's house. The rest of the day is a bit of a blur. I had seen the very best of social media and electronic communication. And then I saw human touch, unafraid, in hard places, loving with wholehearted generosity. I couldn't be prouder of my daughter and the girls with whom she dances. They were courageous examples of grace and compassion and their witness humbles me. At home, while Mary Beth stayed with Rachael, we found ourselves on a bit of a rabbit trail. This post had us researching child slavery in Africa. Nicky, already raw from the past few days of watching and waiting with Rachael, was pushed to brink of emotional meltdown. This was just too much! Too much suffering. And yet. And yet he woke this morning wanting to know more about poverty in Africa. More about what Jesus calls us to do. More about the children. So, I showed him this article, about living for Jesus among the poor, about being young and acting with wisdom and grace and compassion and wholehearted generosity. And that, of course, led to Kisses from Katie (do watch the video on the Amazon page). So that's about it here today. It's raining. Everyone who can read is off in a corner somewhere reading. Karoline and Sarah have overtaken the sunroom and turned it into a pancake restaurant of some sort. I'm getting ready to go get Rachael so she can hang out here for awhile before dance. And we're thinking. About big things. About suffering and loss and God's generous grace. About what it is to truly be Christ to one another. I have knitting progress to report this week! Yesterday, my friend K.C. breezed through Virginia on her way from Texas to Massachusetts. She stopped to sit a spell in my sewing room. After months of saying, "I wish you were here to knit (or sew) with me," she actually was here. I showed her fabric and patterns and told her all about my lofty sewing dreams. We talked sewing machines and ruffler feet. Our children played and played and played. And she helped me past my knitting slump. No, I think she picked me up and lifted me over it. See that button band on the yellow sweater? I picked up stitches. K.C. show me how to do it and then watched me all the way up the band. And, she offered some very helpful tips on posture that seem to have decreased the hand cramps to almost nothing. Happy, happy knitting afternoon. I'm reading every tip and every instruction. And I'm about to commit to actually quilting. But that's a sewing post and not a knitting one, so I'll just leave you with progress on my red scarf-that's-becoming-shawl (gauge issue) and a yellow sweater that might just be wearable by next week. Good afternoon! I'm still knitting my red ruffle scarf. Sigh. I used to be a fast knitter. Not sure what happened. (Well, I sort of know. Sewing happened. So that's part of the slowdown.) Here you see the progress on the scarf and, oh yes, that does look like a twirly skirt for Katie. I've been reading Smart Medicine for Healthier Living and Optimal Wellness. These books, along with Smart Medicine for a Healthier Child, have long been the mainstays of health reference books around here. Still trying to overcome the joint stiffness...those are relatively small pains, though, and they serve a greater purpose as they remind me to keep Kim in prayer (won't you offer a prayer, too, on her behalf?). Knitting, sewing, reading, praying. All good. Go visit Ginny for my reading and knitting tales. I'll see you there! I have a new book to share today, a perfect book for this feast. The Queen and the Cats is the the story of St. Helena of Constantinople, who traveled to the Holy Land in 326 and supervised the excavation of the land where Jesus was buried. She is said to have found the cross on which Jesus died. This sweetly illustrated book, with large, easy-to-read font, tells St. Helena's tale through the eyes of a little girl who was in Cyprus when Queen Helena came to visit and brought a piece of the holy cross. The churches were overrun with vipers and it was the queen who provided a solution to the snake problem and made it safe to worship in the churches and monasteries once more. The author wrote me this morning and offered this sweet deal: We’re offering an incentive to anyone who buys the book in the next three days (Tuesday, September 13, Wednesday, September 14 & Thursday, September 15th)! If they buy The Queen & the Cats in either format, email book@xistpublishing.com with your receipt and we’ll send a downloadable .pdf line-art coloring book version of the book. Buy both editions, (or multiple copies!) and we’ll also mail a postcard icon of Saint Helena. As for other yarns, knitting is painfully slow. The yellow tiny tea leaves is finished through the body but still needs a button band and sleeves. The red ruffle scarf is inching ever so slowly to that huge increase row where I'll go from 200 stitches to 600!. No chance I'm going to hit birthday deadlines. Oh, well. 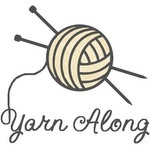 Go visit Ginny for more yarns of both kinds. See you there!